Fringe style is usually hanging loosely from raveled edge or separate strip. Fringe is a fairly narrow line or space forming a boundary. In India fringes style mostly used for little girls garments. Here is the tutorial with Knee length 3 tired skirt.. I love to do this fringed skirt tutorial and share it with all of you..
For Skirt you can use materials like jersey, Denim, Drill, thick cotton, Polyester. For Fringe you can use materials like Leather, Jersey, and Polyester. 6 or 7 Eyelets (Eyelets available in various colors and materials with different sizes) Suggestion of Eyelet is Medium size. Mark with the measurements on Paper or Chart. Lengths are same for the three parts. 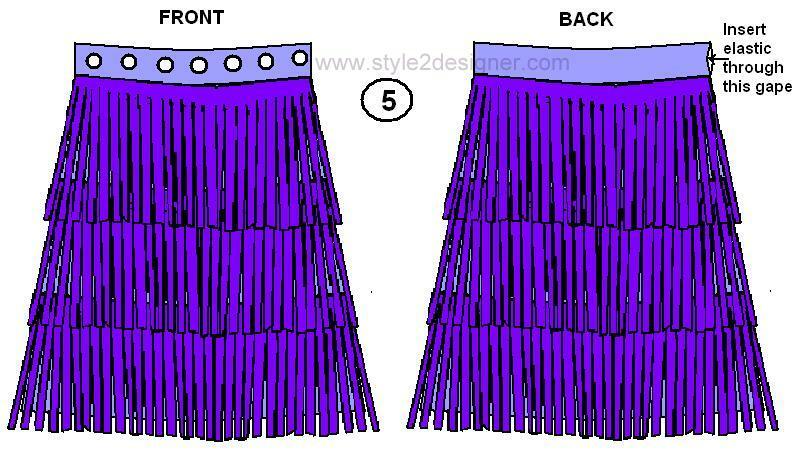 Length of Fringe part should be more that the skirt parts. 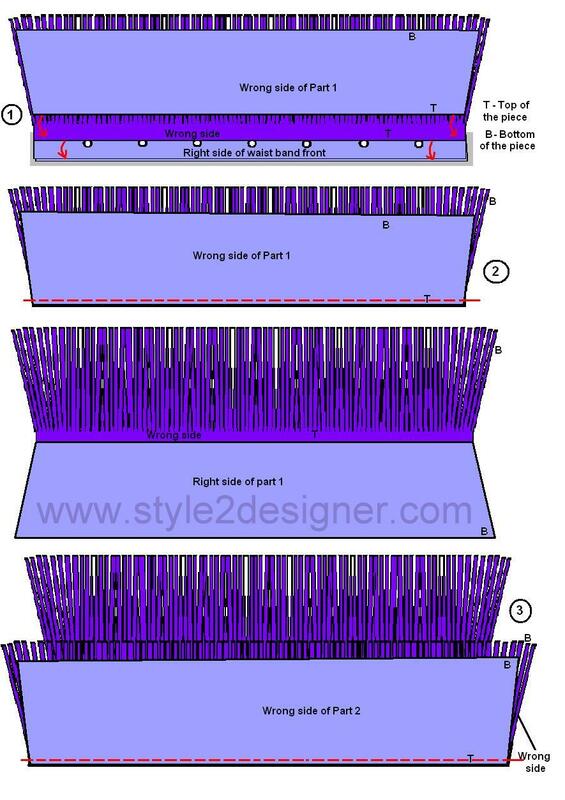 To find Width of fringe you have to add the three skirt parts width at top. 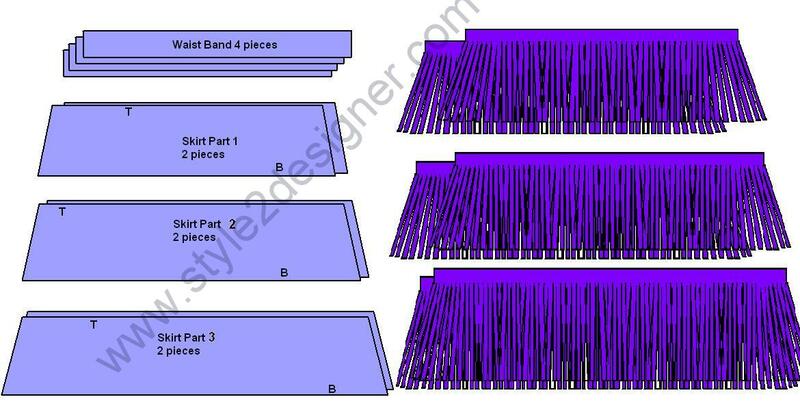 Cut the Fringe part with the above measurement. Then mark horizontal line ½” below the top, and mark repeated vertical lines for fringe with ¼” or ½” as your desire. Then cut the marked vertical lines till the horizontal line (should not cross the horizontal line). Now the fringe is ready. Then Cut the fringe part to match the each skirt parts. Take 2 pieces of WB material and 1 piece of Waxed canvas. Place the waxed side of canvas on the wrong side of one WB piece and press with iron to fix the canvas. Then place 2 pieces of WB by right sides together and sew along the top of WB with ¼” seam allowance. Turn right side out and press again. Then mark 7 equally divided points and marks it with eyelet inside circle. Make holes by Cutting the marked circle. 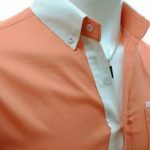 Fix the Eyelet pieces by pressing. 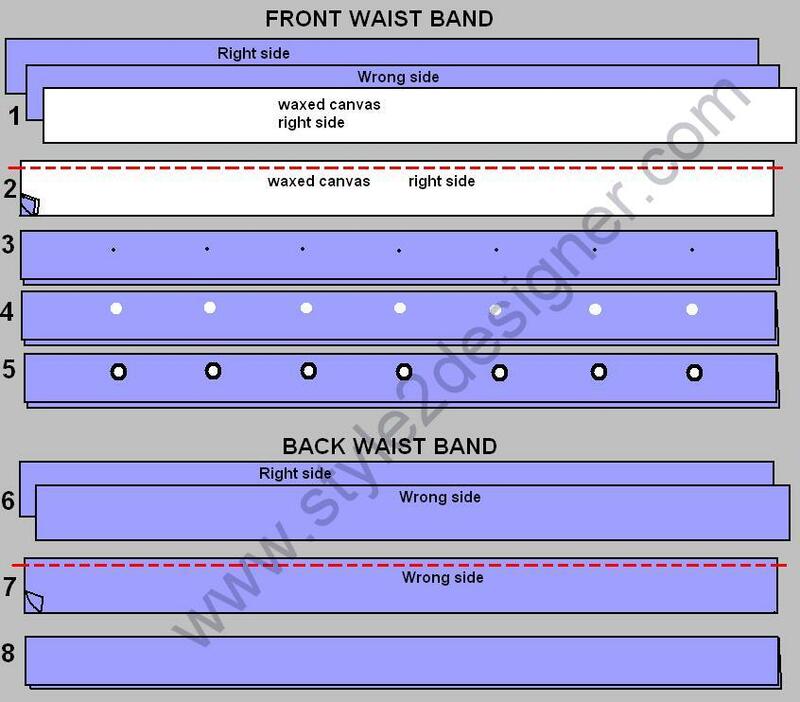 Back Waist Band Making – Take 2 pieces of WB. Take Front waist band piece, 1 skirt part 1 piece and 1 piece of Fringe part 1. Place these pieces by following the instuction given in the above pic., and sew along the line mentioned with ¼” seam allowance. Turn the right side of skirt part 1 and press. 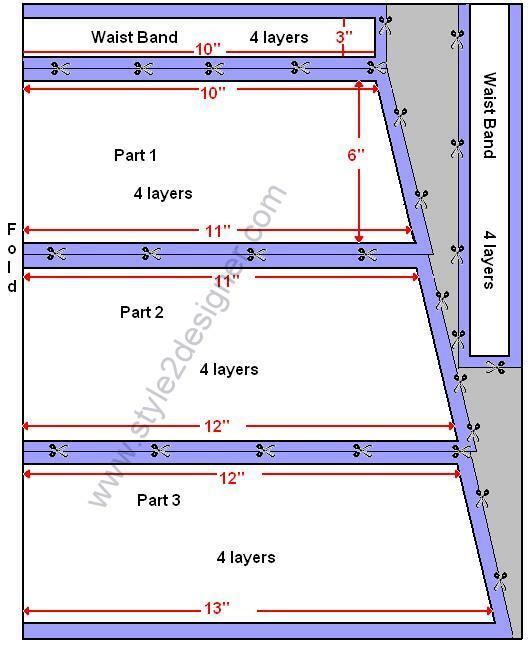 Repeat the step 2 with the next 2 layers. Sew the hemline by double folding of ¼” inside. Insert the elastic through the side seam at Back WB. Pull over the elastic to reach the ends of WB and sew the ends to fix the elastic. Place the Back and Front Skirts by facing right sides together and sew along the side seams with ¼” seam allowance. Now your FRINGED SKIRT is ready….. Here I make this with knee length A line skirt. You can make it with variations like high waist, double layers. Wow You are awsome, I love it! Thank you for your quick respond to my question. Beautiful fridge skirt, now I can make one for my self with your fabulous tutorial, I am great fully pleased, Than you very much ???? Very nice to learn and see the patterns. Very helpful.